Network readiness is an important factor in any new IT project at companies both large and small. New applications seem to require more bandwidth than the applications that they replace. These applications can also bring in new users, sometimes by the thousands. In some cases, the network services and/or capacity are not ready for these changes, and the IT rollout suffers. Does this same scenario apply to K–12 education networks? As new educational concepts are tested and adopted, such as 1:1 learning, flipped learning, ?bring your own device (BYOD), and professional development, it is important to understand how the new applications required to address these trends function, the amount of additional bandwidth needed to support them, and the impact they have upon existing applications. 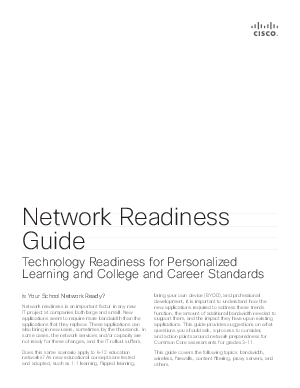 This guide provides suggestions on what questions you should ask, a process to consider, and action points around network preparedness for Common Core assessments for grades 3–11.